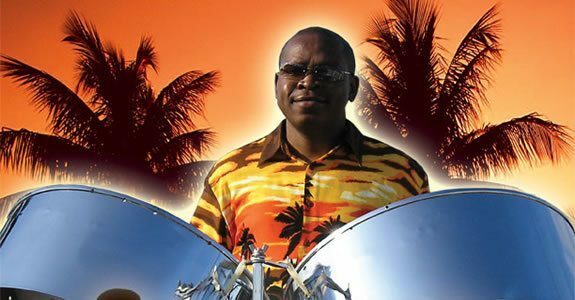 Guyanese-born Ephraim Adams is a musician who has been dedicated to playing the steel drum/band or ‘playin pan’ as it is commonly called for more than eighteen years. Not only is he a player but he also an accomplished arranger. He was taught to play the steel drum while attending Bishops' High School in the late 80's. His ability to arrange music was observed by the Orchestra's Director and soon he was vested with the responsibility as the leader of the School's Orchestra. He performed with the Bishops High School Steel Drum Band Orchestra on many occasions where their performances were breath-taking. In the Finals of the National School Band competition in 1993 they won 1st prize for their performance. After Such an outstanding performance he became very popular and a wanted commodity for the country's big bands. This new fame led him to become a key player with the Banks Invaders Steel Orchestra. In this band, he functioned as a lead player and arranger. He also performed with the Guyana Telephone and Telegraph Company’s Steel Orchestra in the 90's. Ephraim Adams became a well known musician and a member of the Guyana National Steel Band Movement. In his many years of experience he has performed with many other bands touring and sharing ‘pan music’ in Caribbean territories. Ephraim is also the founder of the Holy Spirit Catholic Church's Young Achievers Steel Orchestra and co-founder of “The Live Wire Band” where he functioned as a guitarist, steel drum soloist and a back up vocalist. His multi-talented performances were honored when he was awarded the “Arts and Culture Award” in 1999-2000, by the National Bank of Industry and Commerce, Ltd. (now renamed Republic Bank, Ltd) for his outstanding production of the Annual Festival of Carols. In 2003, Ephraim and his family immigrated to the United States of America and brought his rich culture of music. His love and zest for music has inspired him to diversify and further explore the possibilities of preserving and promoting 'pan music.’ His current performances include: live shows at Universal Orlando (Lone Palm & Bob Marley's Club), Resorts and Beach Clubs in and around Orlando, The Crown Plaza Ocean Deck in Melbourne, freelance work with the Landsharks Band and many others. 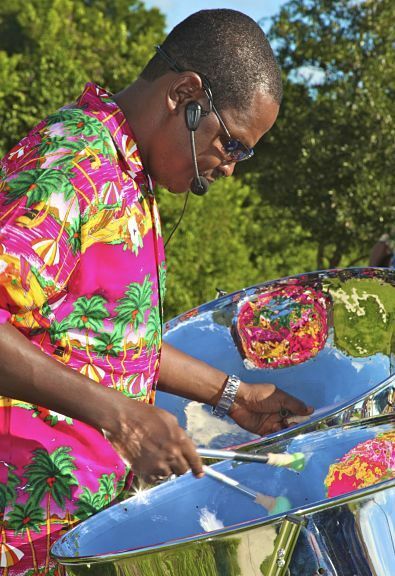 RythmTrail Steel Drum Band provides Live Steel Drum Music for Weddings, Parties, Corporate Events and all events Countrywide and Worldwide. The Steel Drum Band size varies from Solo Steel Drum acts to Four member Steel Drum Band, and the performance is live Steel Drum Music with or without Vocals depending on client request.